Six Maritime is a technologically advanced security company that serves clients with consummate professionalism on the sea, air and land, globally. Using state-of-the-art military and industry practices, our skilled, tested and proven professionals provide clients with tailor-made, cost-effective solutions that ensure both safety and security in any environment. Six Maritime specialises in the use of early threat detection technology, which provides mobile clients the capability to avoid problems before they occur and allows stationary targets more time to prepare safe and appropriate responses to threats. Additionally, to achieve a six-sigma level of success in ensuring the safety of clients’ assets, Six Maritime employs the most highly trained operators in the industry, capable of protecting against even the most heavily armed aggressor. Specific services provided include: global supply chain security services for clients in the shipping, truck, rail and air domains; oil rig and mobile drilling platform protective services; aerial surveillance services, port security consultation and services; and executive protection services. No one in the security industry has more sophisticated technology, knowledge or experience in threat environments than Six Maritime. Our deep and diverse skill sets allow us to lead the next generation of security providers in any threat environment imaginable. Most security firms are lead by the security operators themselves. Six Maritime’s managing board consists of a certified public accountant, former government attorney with a security background and a world-renowned security expert to form a management team focused not only on the client’s physical well-being, but also focused on protecting clients from any and all liabilities, adverse media exposure or monetary loss from any source. 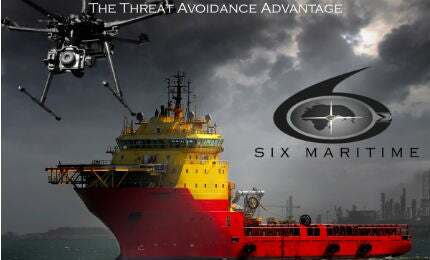 Six Maritime is partnered with Prioria Robotics, a leading provider of cutting-edge security and surveillance technology that can develop unique technologic solutions conforming to nearly any client request. This partnership allows Six Maritime to offer clients implementation of technologic solutions to security threats that no competitor can offer. Six Maritime’s advisory board brings over a century of wisdom to our management and operational decisions. Six Maritime’s advisors have reached the pinnacle of their respective fields to help lead the international fight against security threats globally. Now, these great minds help Six Maritime lead the next generation of security providers. As one of the US’s most technologically advanced maritime security companies, Six Maritime provides clients with tailor-made, cost-effective solutions that exceed best industry practice. Six Maritime is a US and New Zealand managed entity registered in the British Virgin Islands. Six Maritime is pleased to announce ENODO Global as the maritime security company's new strategic partner for intelligence services. US-based security firm Six Maritime has taken on new contracts providing safety and security services to the oil and gas industry in the Gulf of Guinea this year. Six Maritime recently became the first choice of the US Department of Commerce to protect their research vessel fleet, the Ruben Lasker.